I am finally back from my painting trip! I’ll be posting those paintings during the week as they are photographed and finished. Some were completed on location, while others need some studio work to finish them up. I wanted to post them as I went about my trip, but time and imaging software didn’t allow! Much as I wanted to take photos of the paintings and scenes like I did at Boscobel, I completely forgot the rest of the time! I’d get back to the house and realize I never took out my camera while I was painting. It seems I get that one track mind once I have brushes in my hand. I took a trip to Cedar Grove, the Thomas Cole Historical Site, with a group of 11 painters last week. I’d done the house tour before, and commented here that I saw the River Views show there a few weeks ago. 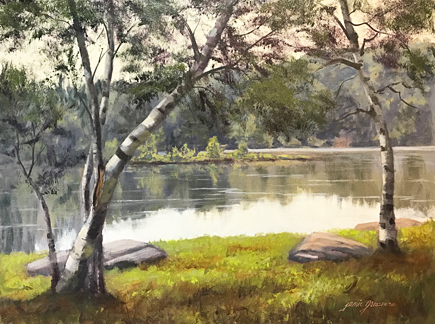 But the show was so wonderful that I was happy to be able to see it again with so many of my plein air friends. Visiting the home of the father of the Hudson River School is a pilgrimage that I like to do from time to time. The day started out overcast and drizzly, so most of us just sketched rather than setting out all our equipment and not being able to pack up fast in a downpour! 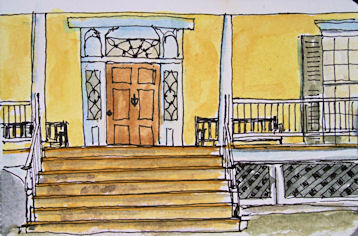 A few of us sketched the Thomas Cole house together from the same angle, sitting side by side. Here’s my version. I’m using an upgrade of my image editing software, which sizes images differently than the previous version. I hope this image comes out large enough to see!